Strata is great for company because you can bake it up mid-week (check one thing off your list) and reheat in the microwave a plate at a time. We had it Blues Fest weekend along with this, this and this! My next post will be FISH! Maybe I should look into some detoxification juice or just stop eating altogether! and lightly set at the center – about 1 hour. 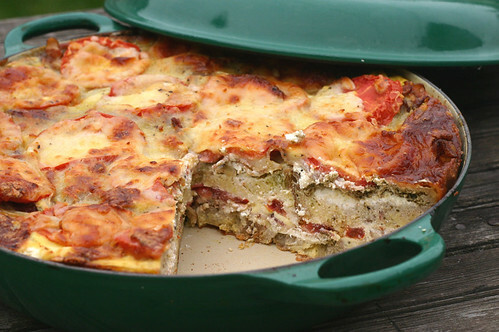 Allow strata to rest 10 minutes before serving. This looks amazing! I love the combination of tomatoes, pesto and cream cheese! What a perfect way to start your day. I think I’ll be making this over the long holiday weekend. I bet some mushrooms would be a great addition too! Hi! Wanting to make, but how is the bread used? cubes? thin slices? Thanks so much…looks amazing! 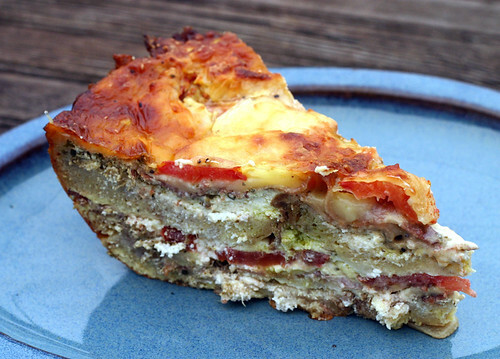 Slices of bread – you’re layering everything, just like making a lasagna. is one round sour dough bread sliced enough?